Apple’s iPhone shipments saw a significant decline in China in last quarter, claims Strategy Analytics. The research firm notes that this was Apple’s worst performance in the country since early 2017. The quarterly performance from Cupertino-based iPhone-maker is hardly an outlier as the company’s smartphone shipments have fallen year-on-year for eight out of last 12 quarters. Apple’s isn’t the only smartphone manufacturer that is seeing red in China, Xiaomi’s smartphone shipment dropped over five million units annually in the fourth quarter of 2018, added Strategy Analytics. As per the research report released by Strategy Analytics, overall smartphone shipments dropped 11 percent in China year-on-year in the fourth quarter of 2018 to reach 108 million units. The overall yearly shipments too saw an 11 percent drop. 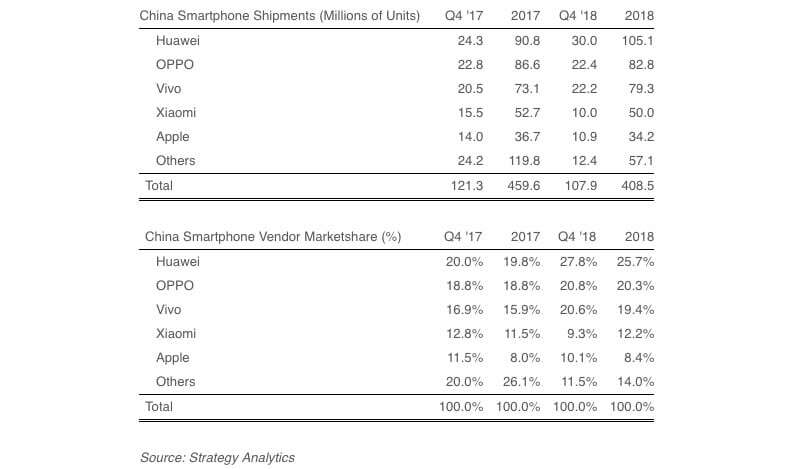 While Huawei was the biggest gainer, Apple as well as Xiaomi lost market share and saw significant decline in shipments, revealed the research report. “The Chinese smartphone market is in recession and has declined for five consecutive quarters. The smartphone market is suffering from longer replacement cycles and weak consumer spending. Smartphone shipments declined 11 percent annually to hit 408.5 million during full-year 2018. The past year has been exceptionally tough and one the smartphone industry will want to forget,” said Yiwen Wu, Senior Analyst at Strategy Analytics, in a statement. The research firm notes that Apple shipped a total of 10.9 million iPhone units in the last quarter, down from 14 million units (a 22 percent decline) during the same period in 2017. Despite the lower number of shipments, the company surpassed Xiaomi to become the fourth largest smartphone manufacturer, based on the number of units shipped. Even though the company market share in fourth quarter declined to 10.1 percent from 11.5 percent a year ago, the iPhone maker’s market share for complete 2018 increased to 8.4 percent from just 8 percent a year ago, the research firm said. Strategy Analytics blames the high pricing of the latest iPhone models for their poor showing in China. “Apple has been under pressure in China for the past three years. Ongoing patent battles with Qualcomm are a distraction, while Apple is being heavily criticized for its expensive retail prices. Apple is in danger of pricing the iPhone out of China,” says Linda Sui, Director at Strategy Analytics. Apple will continue the poor showing in the first quarter of 2019 and it has already cut the revenue guidance for Q1. Apple CEO Tim Cook earlier this month blamed the cut to weaker-than-anticipated sales as well as the ongoing trade tussle between US and China. Among other smartphone makers in China, Huawei shipped a total of 30 million units in the fourth quarter of last year, followed by Oppo with 22.4 million and Vivo with 22.2 million. Xiaomi, which is now on number five in China, shipped just 10 million units in the last quarter, down from 15.5 million units year-on-year, said Strategy Analytics in its research report.